One year into his presidency, Brazilian President Temer is leading a dismantling of crucial protections for Brazil’s indigenous territories and the environment. New policies the president recently approved put at risk indigenous peoples’ rights to their lands, and could open the flood gates for Amazon deforestation, which has been rising dramatically in the past few years. The president’s actions, aimed at winning the favor of the powerful agriculture lobby in Congress, threaten the livelihoods of the indigenous peoples who live in the forests, as well as Brazil’s international climate leadership and the world’s ability to meet the greenhouse gas emissions targets agreed to in the Paris Agreement. One of the world’s largest tropical forest areas, the Brazilian Amazon is home to more than 200 groups of indigenous peoples. Nearly half of the Brazilian Amazon, an area about five times the size of California, is designated as indigenous lands or protected natural areas, and as such is protected from development. These indigenous and protected areas and their indigenous populations were key to Brazil’s decreasing its deforestation by 70% from 2005 to 2014, which has made it the world leader in reducing greenhouse gas emissions. However, these gains are now at risk. Over the last two years, deforestation in the Brazilian Amazon nearly doubled from 4,500 km2 in the period of 2011-2012 to 8,000 km2 in the period of 2015-2016, according to the National Institute of Space Research (INPE). The significant rise in deforestation caused the Norwegian government this year to cut its forest protection payments to the Amazon Fund to about $35 million, $65 million less than in 2016. 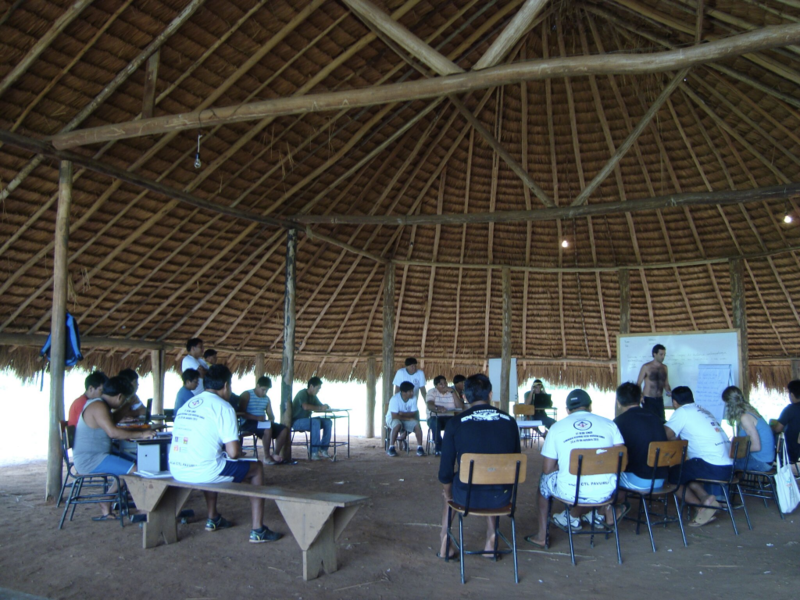 This cut directly affects the indigenous populations in the Amazon, who are among the main beneficiaries of the Fund. Since he took office August 31, 2016, scandal-plagued Brazilian President Temer approved new measures and federal rules aimed at helping him gain critical support from the advocates of agribusiness and large rural landowners, known as the ruralistas, who make up one of the most powerful caucuses in the National Congress with over 200 seats. Temer has created a new federal rule to be implemented by Brazilian Administration that can be used to deny many indigenous peoples the right to their lands. It stipulates that indigenous peoples do not have the right to their lands if they were not occupying them in October 1988, when the current constitution came into effect. Essentially, it denies the right of the indigenous peoples who lack sufficient documentation to prove that they were expelled from their lands during that time. As a result, many pending requests by indigenous groups for titles to their traditional territories could be denied because of their earlier expulsions. Another part of the new rule also prohibits the expansion of existing indigenous territories. Finally, the new rule also allows certain types of infrastructure projects to be permitted on their titled territories without any consultation. A new short-term measure signed by President Temer (MP759) – which can be easily turned into a law – is expected to substantially intensify deforestation in the Amazon region. The new measure facilitates the legalization of public lands that were illegally occupied in the period of 2004 – 2011 and increases the size of land parcels that can be claimed. This measure could result in the loss of millions of hectares in the Amazon to land speculators. Taken together, these developments in Brazil endanger not only the livelihoods of indigenous populations, but also the significant amount of forest carbon stored in indigenous territories in the Brazilian Amazon, threatening the world’s ability to stabilize global climate. The silver lining here is that the advocacy efforts led by the indigenous movement, environmentalists, Norway, and some international organizations are playing a key role in mitigating the effects of the policies and guidance approved by Temer. Now, indigenous peoples need even more support from international actors, in particular from EU governments and international companies committed to reduce deforestation in their supply chains. The governments and business leaders need to tell President Temer to roll back the new rules and measures. This entry was posted in Brazil, Deforestation, Indigenous peoples. Bookmark the permalink. Trackbacks are closed, but you can post a comment.